Zanzibar Corporate Events and Incentives. Get your Team Onboard! OUR YACHTS ARE AVAILABLE FOR ZANZIBAR CORPORATE EVENTS, INCENTIVES & TEAM BUILDING! 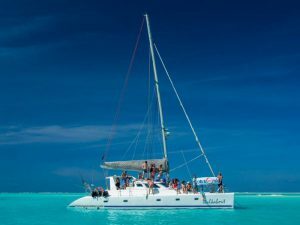 Whether it’s Zanzibar Corporate Events, Incentives, Team Building, or Award Ceremonies you are attending…or after that long Seminar… What better way is there to promote Good Relations than with a Corporate Sailing Cruise onboard one of our beautiful Yachts. Corporate Days out on the water! Sailing to Mnemba Island with a Zanzibar Corporate Events Team onboard! A time to put your cell phone down for a while and enjoy planning your goals and how to get there. All with a clear mind and a relaxed body. Perfect for your next move! 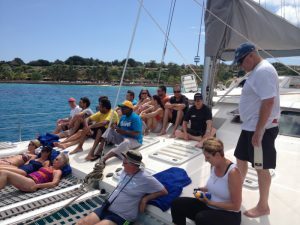 Team building fun onboard a luxury catamaran! Nothing is more memorable and impressive than an event held on a Private Luxury Yacht! Complete with attentive crew, premium catering and complete event facilities. Meetings go better, clients feel special, and staff feel truly rewarded on a Yacht! If you have a Corporate Event, Trade Show or Awards Trip, we can probably help you make it “float”! Yachts, especially Sailing Yachts, are perfect for Company Team Building. What could be a better way for your staff to really learn to work together than to crew a marvellous sail boat through a course? And then celeberate the achievment with a glass of bubbly? Our yachts are expecially suited for this, as they provide a very spacious environment and the process of raising the sails and keeping the boat on course requires true team work. We often have clients who stage a race between two or more boats, complete with a race course set up in the bay. The captains will provide all of the instruction required. Furthermore they will assign tasks, and monitor progress. This can become one of the most memorable days ever for your team! And this is bound to create long term results for your company. Many Companies prefer to get their feet wet by combining a few days at a shoreside Resort with a few days on our Yachts. 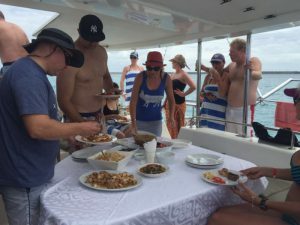 Also a brilliant idea for a “tiered program” – the whole group stays at a hotel for a few nights and then the top achievers get something extra special by casting off on their own Private Charter Yachts! Another option would to send them out for a Big Game Fishing Charter with the beautiful yachts of our partners at Fishing Zanzibar Co Ltd! Need a Hotel Transfer from your Hotel to our base in Nungwi?